We wanted a water dog & we weren’t disappointed with Willow. She’s definitely claimed Ventura Beach and isn’t afraid to jump in. She’s also an avid ball chaser. She cracks us up with her stealthy fetching skills. At 10 months, she’s grown into a gorgeous Weim, and such a love. We couldn’t be happier with our new baby. We are glad that Willow didn’t disappoint. We appreciate all the Facebook posts featuring Willow. So, we have known you for a very long time–our connection is through the Weimaraner. First, it was Roxy and now Willow. Thank you–for your loyalty and keeping us updated. ~1st trip to Brookings OR. Lots of smelling going on. Both she and Jack had a ball. Bella even did a great imitation of the Flying Nun! Showing my age with that old show! Hope you and Cliff are doing well! Zula Blue x Stackhouse the magnificent! Sometimes I think these Weims have all the fun. Who wouldn’t like a trip to Brookings? Thanks for thinking of us. Mommy and daddy took me to a new place with lots of fun stuff to do and new smells. We went to this place they kept calling the beach it was so much fun. We played in the water and I ran so fast. Daddy even brought my ball so I could chase it. I was so tired when we get back I had to take a few power naps. Later mommy and daddy took me on a walk to this place with big rocks by the water. It was so cool there, mommy had a long stick with a string at the end and she kept shaking it above the water until finally she got super excited and pulled out what they called a fish. It was so interesting I kept wanting to put it in my mouth but they wouldn’t let me. We had so much fun I can’t wait to go again. Adria and I were thinking of you today while we walked on the beach. I think it’s wonderful how friendships can develop with the help of our dogs! What a coincidence that Adria and I met in a field with Zeus and Gatsby and found out that they both had come from you! Now we walk together quite often. Today we took them to a beach close to Adria’s house. It was the first time there for Zeus. They had so much fun running on the sand and through the shallow water. Zeus has also developed a taste for starfish, unfortunately. We thought you may enjoy a picture of them romping together and having fun. I’m certain it makes you happy to see them living a good life after they leave you. They are both such good and lovable boys! I hope that you are doing well and think of you often! Thank you, ladies, for thinking of us. It is fun to see them having such a great romp on the beach. It is heartwarming to know that they are much-loved, too! We appreciate this update. It could not have come at a better time. She loves playtime with the kids, fetching & retrieving every day. Introduced her to the sheds, though we’ll wait a little longer due to height and she can still be a bit clumsy at times. She is very smart & likes to test us (repetition is key); we’ve used hand signals along with voice commands throughout her training (helpful for hunting later on, we prefer this method over whistle training). Overall she is very loved, happy, healthy and has made her place in our hearts. We look forward to every new adventure, and with our very active family, she has much to look forward, too! Training is going great! 1st time playing in the sand this week, too! We love the photo documentation. Thanks for that! We love seeing she is working at the Versatile lifestyle thing–all terrain Weimar. Two years ago we received a beautiful blue female Weimaraner from you folks. We met Cliff in Burns Oregon, we are from California. Zelda is what we named her. Stackhouse was there when we picked her up. Her docked tail has a very notable flip to it. Everyone loves it, as she trots, most friendliest to everyone, except cats and raccoons. We live in a pretty normal Weimaraner home. Zelda has been very vocal these days, I can only guess what all the bumbling is about, urban raccoons and skunks. Star of the dog park is Ms. Zelda. As most know, when puppies run into the park the other dogs come over to check her out, sniff, she runs over to the dog’s parent who seems to bother her the most, and plants herself between their legs, they become taken by her and protects Zelda. LOL LOL! Zelda leans into pet parents, they think she loves them. She is very sociable there, everyone knows her by name. We have come across two other young Weimaraners. What separates her from the other weims is temperament and physical appearance, her tail flips up as she moves around, she is outstanding. This is Zelda doing one of her favorite outings. Carmel by the Sea is where this video was taken. Her parents are Stackhouse and Livee, she was born July 12, 2016. We are delighted to hear from you. The videos are fun and the photos delightful. It is good to know Zelda is doing well–that she is living a perfect Weimar life. Thank you, for thinking of us, as well as for all you do for your OwyheeStar girl. Chloe will be 2 in September and has been doing so well lately with obedience- the key seems to be exercise and planning for variety in her routines. She definitely is prone to the concrete thinking so we make sure to mix it up. Photos: Chloe trudges through any river, puddle or lakeshore she encounters- but does not freely swim. She can swim and will if we are also in the water but she seems to mostly prefer wading in up to her chest. And at the Oregon coast-Chloe’s happiest place on earth. She will run for hours chasing birds on the beach and especially enjoys climbing rocks. We’d really love to add a puppy before Chloe gets too much older and too set in her ways. We are glad you love Chloe so much. Well, I love being at home. Nevertheless, if I am able to escape for a vacation let it be the Oregon Coast. We look forward to working with you again soon. Bella spends more time traveling than most and she loves every moment. 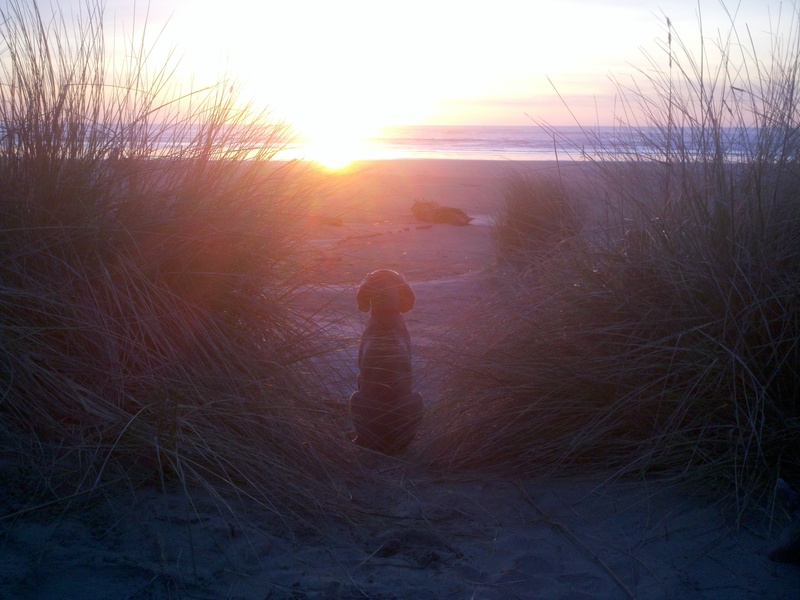 There are times when I long to escape life and one of the best places to accomplish that for me in the Oregon Coast. We have made many trips over the years–but it is never enough. The only thing that is possibly better is to be at the beach with the Weimaraner. I think you might agree. Debbie has Bella and her Levi, too. You might remember them for a while back, but they also sent a couple of fun videos, don’t you agree? Click Here to read the previous blog post, if you missed it or wish to remind yourself of their most recent news. Thank you, Debbie, for the great videos and sharing your experience. We truly appreciate. We hope you are doing something equally fun on the fine January Sunday.